FMCA 2019 – Family Motor Coach Association FMCA’s holds International Convention & RV Expo’s throughout the year. Click here for more details. MAIA 2019 – Michigan Association of Insurance Agents Annual Convention, February 18-20, 2019 at Amway Grand Plaza, Grand Rapids, MI. Click here for more information. MHA (Mobile Healthcare Association) – 2020 Annual Mobile Health Clinics Forum will be held September 12-15, 2020 in Phoenix, Arizona. At the Phoenix Convention Center. MHA (Mobile Healthcare Association) – 2019 Annual Mobile Health Clinics Forum will be held September 14-17, 2019 in Fort Worth, Texas at the Fort Worth Convention Center. NDA – National Dental Association 2018 meeting information details, click here. RSNA – Radiological Society of North America 2018 meeting information details, click here. International Insurance news: The British publication Wealth & Finance International magazine featured an article on Thum Insurance Agency and it’s International Insurance program. Read the full article here. A new proposal could let mobile vendors and retailers sell their goods without hassles. Read the full article here. AHRQ – Agency for Healthcare Research and Quality – Innovation Profile: Mobile Clinic Delivers Culturally Competent Services to Underserved Neighborhoods, Leading to Identification of Untreated Chronic Conditions, Better Blood Pressure Control, and Significant Return on Investment Read the full article here. Michigan Governor Rick Snyder signs motorcycle helmet optional law Michigan Gov. Rick Snyder has signed into law a bill that would allow motorcycle operators 21 or older to ride without a helmet, his office said today. Read the full article. The Irish Jig is a Grand Rapids event held to promote colorectal cancer awareness. 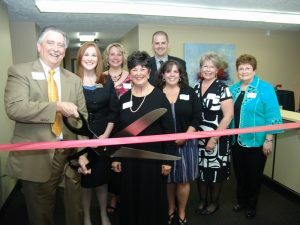 Thum Insurance Agency celebrated its 20th Anniversary and the relocation to its new offices with a ribbon cutting and open house on April 7, 2010!